"This will seem like a fancy soup without a lot of effort. 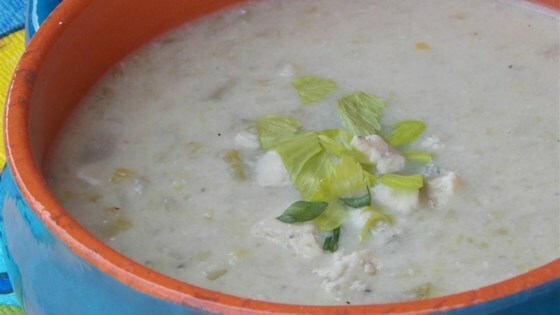 Stilton cheese is really rich and creamy, and gives the soup a wonderful flavor." Melt the butter in a large pot over medium low heat. Add the onions and saute for 10 minutes, or until onion is translucent. Add 2 1/2 ounces of the Stilton cheese to the soup and mix well. Puree the soup in small batches in a blender or food processor and transfer it to a clean pot. Season with freshly ground pepper and salt to taste. Stilton can be very salty, so beware! You may also make this soup with celeriac instead of celery. Something missing here. Soup tasted OK but was quite watery. Needs cream or milk somewhere along the line. I used chicken stock instead of water (about half of what the original recipe called for), white cheddar instead of stilton, and added 4 small potatoes with the celery. It was delicious! Pretty good but lacks thickness so I added cooked rice to finished soup; very tasty if you like blue cheese! I used butter and 21/2 cups of chicken stock, and just a pinch of white pepper for a little zip. Needs potatos to thicken it, plus possibly cream, and definately 1-2 Chicken stock cubes.